A rare 'hybrid' solar eclipse will happen this Sunday, November 3rd and it will be visible in the Philadelphia area. 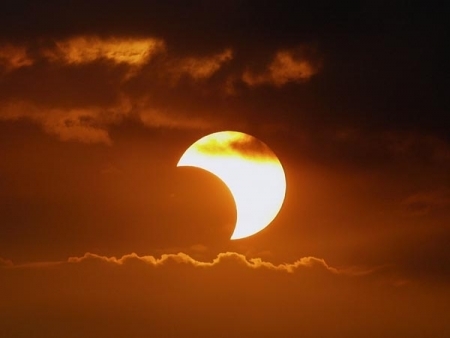 The hybrid solar eclipse (or an annular/total solar eclipse ) is an extremely rare occurrence. Of the 11,898 solar eclipses listed over a 5,000 year span from 1999 BC to 3000 AD in Fred Espenak’s Five Millennium Catalog of Solar Eclipses, only 569, or 4.8% are hybrids. It has to do with the curvature of the earth affecting which location's on earth's surface fall in the moon's umbral or atnumbral shadow. If you want to see the partial solar eclipse in the Philadelphia area you will have to get up at dawn. The eclipse will already be underway when the sun comes up. Sunrise is set for 6:32 am in the Delaware Valley and there will be partly cloudy skies. It will finish up 30 minutes after sunrise.